The other day someone asked me if I was going to make goals or New Year's Resolutions. I replied I was not going to do so. In the past I have made them and broken them. So my new approach is that I want to make each day the best I am able to make it. I will live in the present. I will not dwell too far in the future nor shall I linger in the past. Today is all we have. We are not promised any future....we do not know what is coming. But we can enjoy the time we do have. As I sit here waiting for my husband to go to a holiday party, I am enjoying a soft drink and the fact that all my children are gainfully employed and seemingly quite happy. I take a deep breath as I thank the stars above for my sister who wants to spend two weeks each year with us during the holiday season. I treasure the little adventures we take and the friends we take with us. Life is good and I am happy. What more could I ask for? 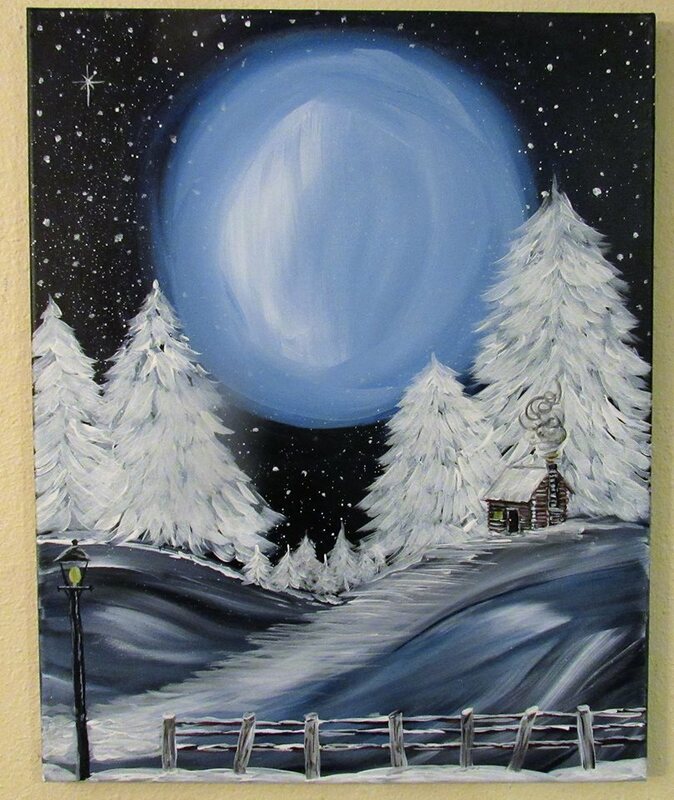 Artwork by the talented Maxine Addington, who can teach YOU how to paint as well! I have a warm house. I have food. I have love. I am thankful for all that I do have. When small irritants come my way, I remind myself that those are first world problems. I really have nothing to complain about. Life is good, as my friend Martin says. Yes, life is good! Enjoy the year. Enjoy the day. Treasure each moment you receive - your gift is the present! Peace to you all and Happy New Year! I have moved to Spokane Valley, WA. I still use your relaxation techniques - oh YES! Learning a lot of God's lessons - this time around! Hope all is well with you and your work is on time and fulfilling for your heart and soul. I DO HOPE YOUR IN THE PROCESS OF WRITING A BOOK! YOU ARE CREDITED AND KNOWING ON A MANY FACETED SPECTRUM OF THE MINDS WORKINGS. WRITE THAT BOOK. AND WHEN YOU DO, EMAIL ME FOR I WILL BUY IT. I very much enjoyed what you know and what you shared. Mostly, for caring. As you do for everyone. AS FAR AS COMMENTING ON YOUR BLOG AS YOU REQUESTED. MY ONLY LIGHTBULB THINKING IS THAT IN THE BEGINNING, IT WAS A BIT HEAVY (HARD TO RELATE TO) FOR THE GENERAL POPULATION. SO MUCH, SO AWFULLY MUCH THESE DAYS!!! ALL THE DEVASTATION GOING ON. God said he will not destroy the world again....true, for we will do it ourselves if the minds of pp do not elevate to a higher level. Be safe, fill your heart and soul as much as you can. Thank you for writing me Lola.